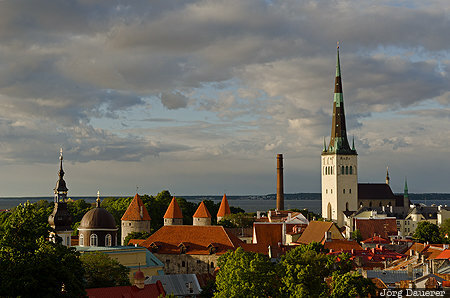 Downtown Tallinn seen from Toompea hill (Cathedral Hill) dominated by St. Olaf's Church at the right and the towers of its city wall at the left with the Baltic Sea at the background below dark clouds illuminated by warm evening light. Tallinn (formerly called Reval) is the capital of the Baltic state Estonia. This photo was taken in the evening of a sunny day in June of 2014. This photo was taken with a digital camera.